I've always liked Arnold Schwarzenegger as an actor. He never pretended to be someone he isn't and his roles were usually well chosen. At the same time, it was nice to see how he broadened his scope and evolved as a professional over the years. "Total Recall" gave me numerous interesting insights into his background as well as his career in entertainment and politics.I found the childhood part particularly fascinating. Growing up in post-war Austria, in a not-so well-off family and with a father from the military shaped his character. After that came the time for fulfilling his greatest dream of success in bodybuilding. I have to admit I've never found this sport interesting but the way he describes his meticulous preparation and true passion allowed me to find a new appreciation for bodybuilding. Schwarzenegger's career in movie industry is a true testimony to his perseverance. Once he set out a goal he did everything he possibly could to achieve it. This part of his biography was really interesting to follow as there were many stories from the industry, curious facts that are normally not known by the viewer who has no access to what is happening backstage. The author's story is presented in a very entertaining way and it reads really well. What particularly impressed me was the author's honesty in admitting the mistakes he's made over the years and how they affected his life. I think I might have underestimated his intelligence and political instincts. I tended to believe that his fame and people skills were the driving force behind his success, while in reality there is a lot of cunning and calculating. Hi involvement with the disabled, prisoners, fighting juvenile delinquency, are aspects of his career that I wasn't aware of and was very impressed by. Schwarzenegger is a man of contrasts. He is a republican who married a woman firmly rooted in democrat family and throughout his political career managed to have good relationships with representatives of both parties. He is an environmentalist who drives a hummer. And yet in between all of those contrasts there is a wise man who's always tried to achieve more for himself and his people. A man who has achieved pretty much everything he planned. 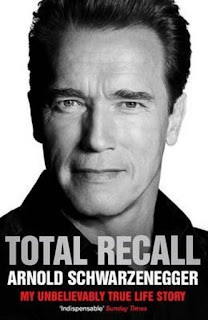 "Total Recall" is a positive story that can be both entertaining and motivating.